Chances are that you’ve seen a byobu before but just not realized it. 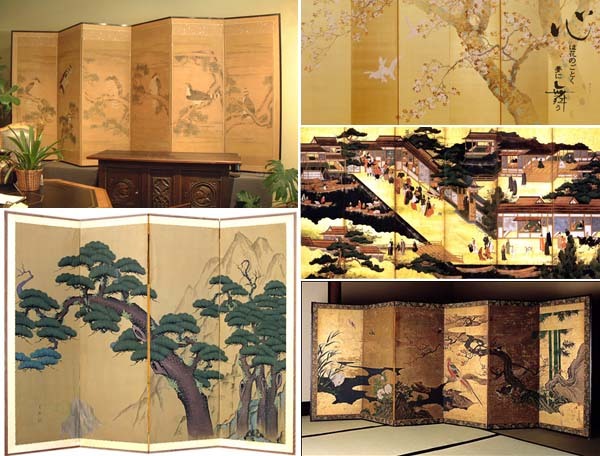 A byobu is a decorative Japanese screen having multiple panels, all of which fold so as to stand upright on the floor to act as a room divider. The term makes sense when you find out that, figuratively, the word byobu means “protection from wind” (as in drafts). Though byobu are practical in their application, they are often elaborately adorned with Japanese scenes and calligraphy, making them significant within the decorative arts.